On 17 May 2012, the BBC reported that the government had confirmed tram-trains which run on street tracks and railway lines are to be piloted in South Yorkshire, in a scheme worth £58m. Starting in 2015, the newly-built tram-trains will run on local tram routes and Network Rail lines between Sheffield, Meadowhall and Rotherham. On 19 June 2013 Railnews reported that “The first tram-train service in the UK is being given the go-ahead by transport minister Norman Baker today”. The service, costing around £60 million, will run from early 2016 between Rotherham Parkgate and Sheffield city centre, using both the existing tramway and the national rail network. Three new tram-trains are being built by Vossloh. They are dual voltage, which the DfT said makes them ‘future proofed to cater for any subsequent electrification of the Midland Main Line by being capable of operating at both light and heavy rail operating voltage‘. Network Rail will build a new junction between the light rail and heavy rail lines near Meadowhall South. So, what’s changed between the two announcements? Very little, apparently, apart from the costs. The 2012 BBC report said that seven tram-trains would be procured, but the 2013 Railnews one says the number is three. It seems that new rail schemes have to pass some sort of minimum-level-of-absurdity test, before getting Norman Baker’s approval. And the tram-train scheme is no exception. The plan is to electrify the railway from Meadowhall to Rotherham Central at 750 volts dc, meaning that future operation of electric railfreight on the route would be impossible. So, what’s the point of buying dual voltage trams? South Yorkshire Passenger Transport Executive (SYPTE) has welcomed the Department for Transport’s (DfT) announcement for the new High Speed Rail (HSR) network to serve the Sheffield City Region. DfT confirmed that a station will be built just off the M1 motorway (junction 34), near Meadowhall, as part of the second phase of HSR. Services to the Sheffield City Region (SCR) are due to commence in 2033, but the hard work begins now to make sure that everything is up and ready. The first and second phases connect the SCR to London, Birmingham and the West Midlands, the East Midlands, and Leeds. Sheffield City Region covers South Yorkshire and parts of north Derbyshire and north Nottinghamshire, including Worksop, Chesterfield and Retford. The city region’s high speed station will bring significant benefits to the region’s economy. Research carried out on behalf of SYPTE and Metro (West Yorkshire PTE) showed that High Speed Rail services in Yorkshire would generate an estimated £2.3 billion of local economic benefits on top of the predicted £60 billion of national transport benefits. By linking the Leeds City Region, the Sheffield City Region and the East Midlands, HSR would connect an area of 6.7 million people and 3 million jobs. Journeys from Sheffield to London will also be reduced from 2hrs 7mins to 1hr 15mins. Whilst quicker journey times will bring the capital and the Midlands nearer, opening up new markets and business and job opportunities, the capacity on existing rail lines that HSR will free up is also hugely important to accommodate the growing rail demand in the Sheffield City Region. Although it will be some time before HSR services begin operations to Sheffield City Region, the benefits could be felt well before then as businesses grow and relocate to station locations along the route. The M1 location is expected to give a huge boost to the surrounding area, as well as across wider South Yorkshire. Cllr Mick Jameson, Chair of South Yorkshire Integrated Transport Authority said: “This announcement is the result of a lot of hard work by people across the Sheffield City Region and beyond and is hugely important for our future economic competitiveness. The Leeds branch of the HS2 Y network concept has always included a station in South Yorkshire, but politicians and local government officers had no influence on where it would be. It was a topic hardly discussed at the Integrated Transport Authority, so Mr Jameson’s claim that the announcement “is the result of a lot of hard work by people across the Sheffield City Region and beyond” is nonsense. The claims that Meadowhall HS2 would offer “much improved connections” to London and other cities, and open up “many new possibilities when capacity is freed up” are also detached from reality. There is no evidence of pressing capacity shortage in South Yorkshire, and passenger rail usage there is worryingly low. For long distance journeys, experience shows that business and leisure passengers prefer direct, no-change rail services, which HS2 Meadowhall could not offer. 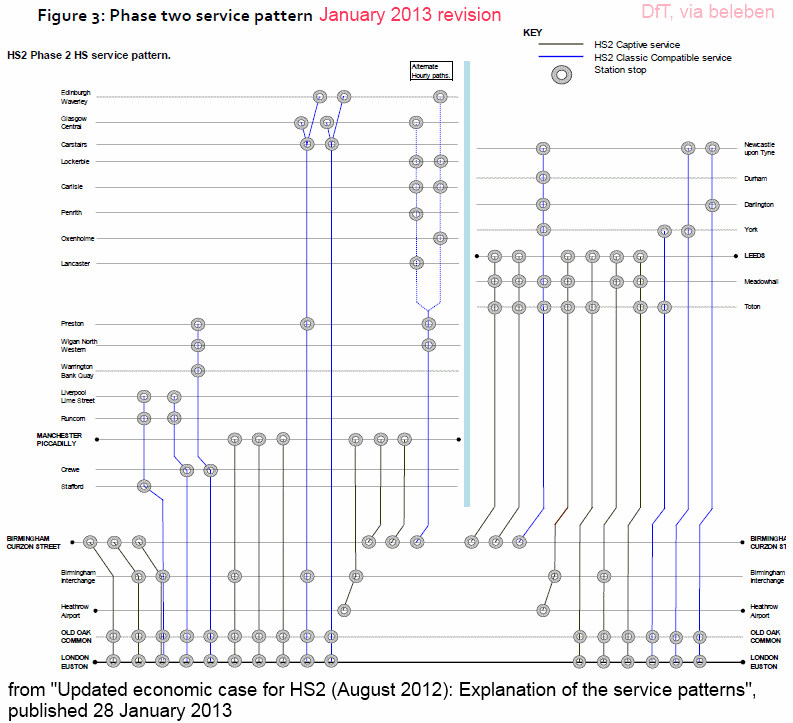 HS2 Ltd’s 28 January 2013 proposed service pattern would only directly connect Meadowhall to five towns in the North (Leeds, York, Darlington, Durham, Newcastle-upon-Tyne), and one in the Midlands (Birmingham). All of those destinations are currently served by intercity trains from Sheffield Midland. It’s likely that Meadowhall HS2 depresses the benefit-cost ratio of the Leeds leg of the Y network concept. The station would be bad for the Sheffield economy, and irrelevant for most travel from the eastern part of South Yorkshire (Doncaster area).